As a community partner with Western University, 4th year Medical Science students at Schulich School of Medicine & Dentristry created a pitch video last fall for our work together on yoga, mental health and addiction recovery. Focusing on healthcare, science, research, communications and outreach, this fun and informative video displays the vision of the project - summing it up wonderfully! In the upcoming weeks on social media I will be sharing infographics created from their work, which outline the mental and physical benefits of specific yoga postures. Hope you enjoy! Thank you videographer Ryan J. Wong, Priscilla Matthews, Victoria Forcina, Natalie Mercuri, Nick Tang and Erin Biggar. One of the best things about being sober is the ability to recognize without influence or clouded judgement when something in our lives may not be serving us. 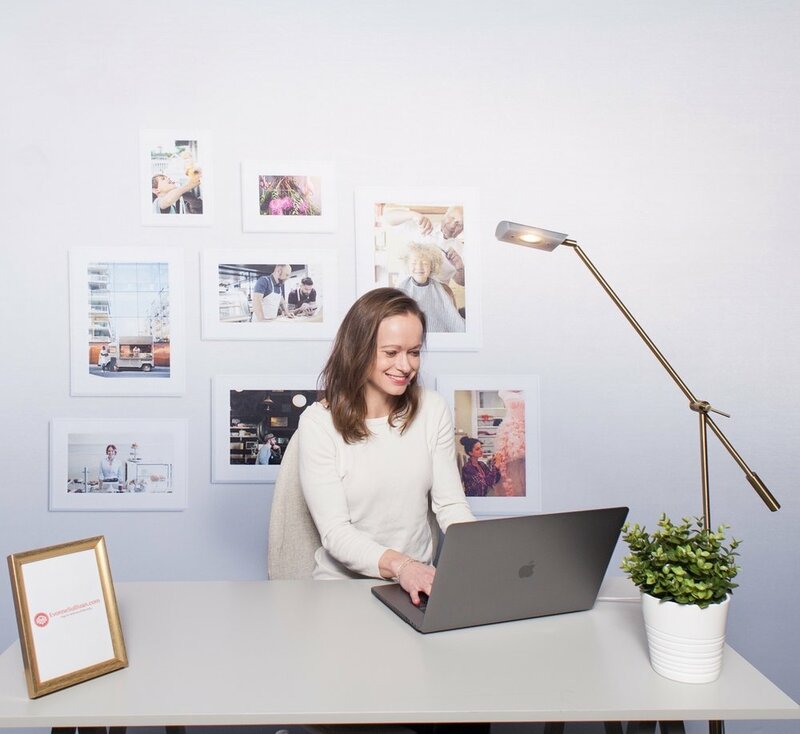 I have always dealt with seasonal depression and although mild in comparison to my younger years, lately I have started to notice that social media seems to be exacerbating the symptoms. In addition to spending time with my family, the last few days I have been focusing on the administrative and preparation components of my work, rather than being online. A mindful, positive mental health choice. I believe the key is awareness and moderation. So here are both sides of the coin for social media. We can evaluate the benefits or drawbacks of anything in our life. Needs change based on circumstances, challenges, health, age, interests, evolution, career, family, relationships, and so on. I wrote this post earlier today from the lounge of a downtown hotel where I brought my work. The room has massive wall windows, allowing the sun to (finally) shine in. I am able to take pause and notice now when something feels off, rather than reaching for unhealthy escapes. This, so I may find the sun, not just in a room, but also in my heart. Thrilled to be teaching in the Toronto Yoga Show and Conference again! I will be hosting two workshops which combine lived and professional experience with specialized training and teachings: Mind-Body Health and Addictions Recovery: A Holistic Health Approach. To learn more and register follow this link. The conference this year takes place March 28 - 31, 2019 at the Metro Toronto Convention Centre. 4 days, 300 exhibitors, 62 instructors, and 30,000+ people! The elevator in my condo building has a sign posted wishing us a ‘peaceful and prosperous new year’...but what really is prosperous? When I was 2 years sober and still very much learning how to manage mental health and life challenges without alcohol, I fell into a deep depression. During these times, my mother would visit; helping me eat or to get out of bed and walk a bit…basically anything for nutrition or body movement. It was a horrible time, depression is not unfamiliar to me, but this time it was paralyzing. One day she arrived with a poem printed from the internet and pasted it on the fridge. I take these words with me for personal and professional goals this coming year. I resist urges to compare and compete, stay true to myself, hush negative self-talk, search for more light and know that we must try to make the most of the cards dealt because this friends, is the only life we get. It’s official! I am a resident of the city of #Toronto again. It’s been a long journey working towards this but I am thrilled to begin new adventures. I left the city 7 years ago as a result of mental health and addiction challenges…needing to get better. Now, a person in long-term recovery and with a whole new lease on life, I am truly grateful that I am returning; healthy, with support from family and friends, work that I hold dear to my heart, and of course, hopes and dreams. I will keep this short and sweet. As of October 23rd, I am proudly 6 years sober. Thank you, thank you, thank you. Excited to share this collaboration with the wonderful folks at mindyourmind, a national youth mental health organization here in Canada. One Sunday morning not too long ago we sat down to chat about my ‘Yoga for Wellness & Recovery’ program and the benefits of mind-body work for mental health and addiction recovery. We also touched upon my lived experience and how the inclusion of yoga and mindfulness practices into your recovery plan is effective in balancing moods and long-term health improvements. Hope you enjoy! I have been thinking a lot about choices lately. The last few weeks have been quite busy and without realizing it, I lost my ‘creative’ time. The key for me is to recognize idiosyncrasies in my mood and then evaluate what is missing or needs to be changed. So last week I made some alterations in my schedule and almost immediately the heaviness in my shoulders lessened and I became inspired again! Took this photo a few weeks ago in West Toronto on my way to Marilyn Bell Park to practice some yoga by the water. It was a beautiful evening and this image captures how life can get away from you. What is important for me at these times is awareness plus the ability or willingness to make choices for change. Perhaps take a few moments without distraction and just breathe. Check in with your physical body and emotions to take notice of how you are really feeling about a situation or decision. Always remember that asking for help or talking with others can also be a great means of support. Thanks for checking in. I have been quite busy from the end of 2017 into 2018. Happy New Year! Thank you all for the support - community members, class attendees, Western University, CMHA National, Recovery Week London, HealthAchieve, CBC London and the yoga world who is embracing Yoga for Wellness & Recovery with open arms. A new venture I have begun is to expand teaching locations and provide Yoga for Wellness & Recovery workshops around Ontario. In doing this, I have the wonderful experience of meeting many lovely souls on similar paths and am able to share mind-body tools for health and healing with a greater audience. To learn more about available workshops check out events or contact for more information. I created 'Yoga for Wellness & Recovery' as a short form: Yoga for (mental) Wellness and/or (addiction) Recovery. This is based on personal struggles and to be able to share resources and practices that were, and continue to be, fundamental in my own journey. Coming up in April I am absolutely honoured to be one of the 72 instructors invited to teach at Canada’s largest yoga event, the Toronto Yoga Conference and Show! Over 4 days, April 12 - 15, this event welcomes 30,000 plus attendees. I will be hosting 2 sessions: Mind-Body Health and Yoga for Wellness & Recovery both of which combine specialized teachings and trainings alongside lived experience in mental health and addictions recovery. I am thrilled for the opportunity to share my true passion and much needed resources at this scale with so many others. It becomes more evident everyday to the public, media and the yoga community with the tragic passing of well-known Buddhist and yoga teacher Michael Stone, that we all are affected by mental illness and addiction directly or indirectly and that addiction is a mental health issue. As a result, my work addresses mental health and addiction recovery concurrently and is for those dealing with their own challenges, family or friends supporting others or individuals wishing to learn more about yoga for healing. For more information and registration on the Toronto Yoga Show click here. I will check in again soon! In the meantime, Instagram is updated daily with posts from life and work...yoga, teachings, trainings, speaking, community classes, reflections, events and some fun! Today I am 5 years sober. I smile in this photo because I know I am lucky. Even with its anxieties and pain, life is a precious opportunity. The background of my laptop remains unchanged for years now… “She said she couldn’t survive and never realized that’s what she had been doing the entire time.” These are your roses Roger. I know this photo would have made you smile too. A big thanks to everyone who has supported ‘Yoga for Wellness & Recovery’ and my vision for EvonneSullivan.com. I am beyond grateful to be able to share my true passion with others: mind-body tools for mental health and addiction recovery. Much love to my family, friends, friends who became family, my home group, the rooms, recovery yogis everywhere, my long-time psychotherapist the late Neil Campbell, the World Wide Web, Bellwood Health Services, London Health Sciences Centre and my two favourite cities, London and Toronto. I merged together information, resources, places and people to create a custom healing environment. It was not easy or cheap. I support and believe in the recovery movement. So we may work towards achieving fear-free and barrier-free access to addiction recovery resources. So the reach for health becomes attainable and not shamed or punished. For the many we’ve lost and to the countless trying to find their way – you deserve compassion, openness and community. Look hard enough and you will find it. The Yoga of Recovery Certification Course was an amazing experience both personally and professionally. Learning how to assess body constitution and adjust lifestyle habits can improve and ease the path of recovery. We were provided with tools to implement into our daily lives, as well as knowledge and application to bring back to students and clients. 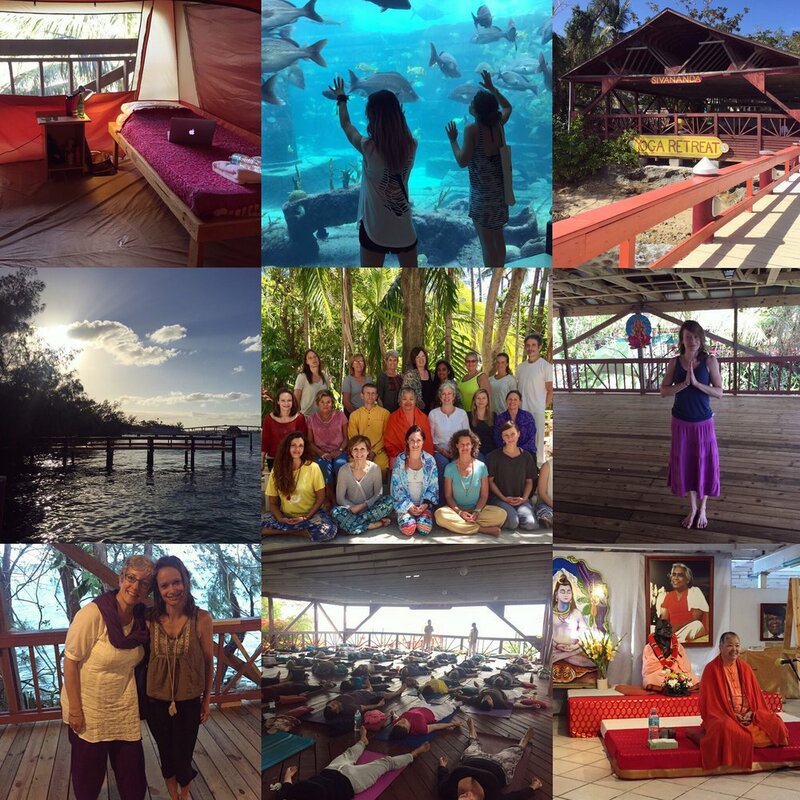 Durga Leela is a wonderful teacher and visiting the beautiful Sivananda Ashram Yoga Retreat Bahamas was a once in a lifetime opportunity. The ashram housed 300 plus guests and karma yogis. We celebrated Seder, Easter and daily morning and evening Satsangs (gathering together for the truth) with individuals from across the world, including many other Canadians. The beaches of Paradise Island are vast and breathtaking. I welcomed silence of the mind, calming of the body and fullness of the soul. Thank you to Durga Leela (Yoga of Recovery) and Tommy Rosen (Recovery 2.0) for entrusting me to chair nightly open 12-Step Discussion Meetings for this 2-week period. After dinner, visitors, karma yogis and those part of the Recovery Symposium gathered to focus on recovery, check-in and form fellowship…a home away from home. If I had been told 5 years ago that I would leading recovery support groups of 20 to 30 others journeying to health while overlooking the clear waters of Nassau, most likely I would have laughed, definitely not understood the significance. I cherish these special memories of service and friendship in such a unique special environment. Amongst like-minded spirits, following their hearts towards wellness and peace – I found a place of love, vulnerability, growth, experience and connection. As part of the Addiction Recovery Breakfast Committee with Mission Services of London, The Salvation Army, Addiction Services of Thames Valley and Turning Point Inc. we are hosting a week of events from September 11-15, 2017 that celebrate recovery in London! To register for any or all of the events for visit: Recovery Week London. To join me at Innovation Works for an evening of Yoga for Wellness & Recovery visit: Recovery Yoga. During the month of September, Canadians in recovery from addiction join with friends and family to build awareness, challenge societal stigma, and celebrate the role that recovery plays in improving the lives of individuals, families, workplaces and communities. From April 10th to 24th, I will be in the Bahamas at Sivananda Ashram Yoga Retreat to obtain my Yoga of Recovery Certification, as well as attend a Recovery Symposium. Looking forward to learning new skills and techniques to bring back to my classes and teachings. These 2.5 weeks will be challenging but no-doubt an exciting experience full of personal and professional growth. A couple weeks ago I had a lovely time sitting down with Marcus Wong and Jennie Malone discussing The Health Benefits of Yoga: Mental, Physical and Recovery! Health4U - Episode 9: Yoga. Listen here! “health from all different angles and perspectives”. Radio Western 94.9 FM CHRW at The University of Western Ontario. Namaste Friends! Sending love and light. Looking forward to being a guest on one of my favourite podcasts! Whole Body Mental Health Radio. Wednesday, April 26th. 8 pm EST (details to come). Dr. Calderon, his guests and episode topics have been very helpful in my understanding of mind-body medicine, the mind-body connection and mindful psychiatry. Whole Body Mental Health Radio is a show that thinks broadly about mental health and addictions, from the mind-body connection and the gut, to the environment and the world. It seeks to broaden the discussion about mental health and addictions.